Art Buzz February 3, 2012: Louis Kahn: Can You Tell An Architect Is Jewish By His Style of Building? Can You Tell An Architect Is Jewish By His Style of Building? Schwarzer is unconvinced. He assesses a few of the architects profiled—like Louis Kahn—and sees little evidence of Jewish thematics in their work. It is only when the book reaches Louis Kahn that readers are asked to detect, and then only slightly, a Jewish building sensibility. Yet where does Kahn’s architecture show that sensibility? … We read that Kahn, though not a practicing Jew, visited Israel. This correlation seems a stretch. Apparently, he thought he could probe the subject more thoroughly than Solomon did, but according to Schwarzer, he’s failed to persuade. In its heyday, Bankers Hill was the center of luxury and wealth in San Diego. The end of the Victorian era brought huge growth to the city as a whole, but especially propelled the few blocks west of Balboa Park into popularity among the financial elite. The name “Bankers Hill” comes from the great number of financiers and banking tycoons who made their homes in the area. Perhaps the most culturally important mark Bankers Hill made on San Diego’s history was its abundance of architectural gems, some of which still stand today. 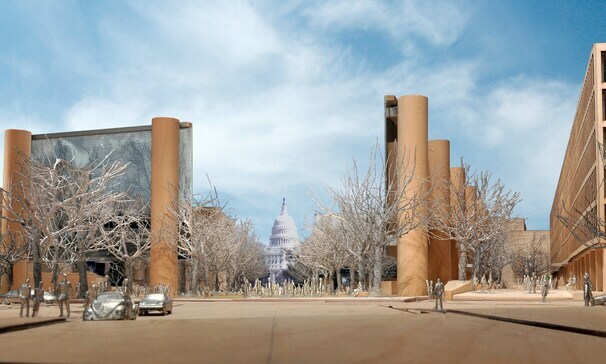 Anonymous/AP – This artist rendering provided by the Eisenhower Commission on Oct. 6, 2011, shows an updated model which shows the Maryland Avenue vista and promenade for the national memorial in Washington for President Dwight D. Eisenhower. Eisenhower’s family wants a memorial in the nation’s capital redesigned, saying the current plans overemphasize his humble Kansas roots and neglect…Architect Frank Gehry’s design for the congressionally authorized memorial to President Dwight D. Eisenhower is creatively unconventional, innovative in form and use of materials, monumental in scale — and the wrong thing to build.